For flights to Cork, visit the Cork Airport site for the latest information. Airlines serving Cork include Aer Arann, Aer Lingus, Air Southwest, bmi baby, Centralwings, Jet2.com, Malev, Ryanair, SkyEurope and Wizz Air. Destinations can be found on this page. 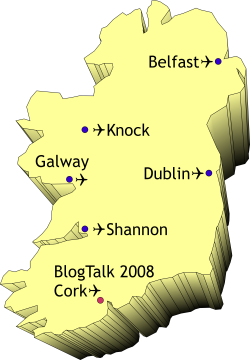 Other major airports in Ireland include Dublin and Shannon. These are shown on the map below. The cheapest way to get to Cork from these two airports is by bus (see below). Once at Cork Airport, Bus Éireann provides a bus service from the airport to the city's bus station. It takes 25 minutes and costs €3.90. SkyLink also have a shuttle bus that serves various city locations including hotels and B&Bs. It takes 30 minutes and costs €5. There is a taxi rank located outside the main terminal building. The cost from the airport to the city centre is between €10 and €15 approximately. Unfortunately, the first Roscoff (France) to Cork ferry service of the year begins on 14th March. There is a ferry back from Cork to Roscoff on 15th March. There is a train station with regular trains (Irish Rail) to and from Dublin, and Limerick. From Dublin, prices are around €31 single and €61 return. Buses (Aircoach, Bus Éireann) run directly from Dublin to Cork: this is by far the cheapest way to get to Cork from Dublin. You can also get a Bus Éireann bus from Shannon to Cork (you change at Limerick), which takes about 1.5 to 2 hours. Various car hire companies are located in the Cork Airport arrivals concourse: Avis, Budget, Hertz, Irish Car Rentals, and Alamo / National. You can also pre-book with Dan Dooley, Enterprise, Europcar, and Thrifty. You can get driving directions from Cork Airport to the Kingsley here, or alternatively you can view the directions from Google Maps. If you are driving from other locations in Ireland, the Kingsley provides comprehensive directions on getting there. You can get the number 5 or 8 buses from the city centre to Western Road and Victoria Cross (near the Kingsley). UCC provides a useful map of these routes. The Kingsley Hotel is located 2.9 km from the city centre. This will take about 35 minutes on foot (at 12 minutes per km). Here are the directions. If you are staying on Western Road in one of the B&Bs beside University College Cork, the walking distance to the Kingsley is about 15 minutes and to the city centre is 20 minutes.